How do I even describe this book? Let’s start with the basics. 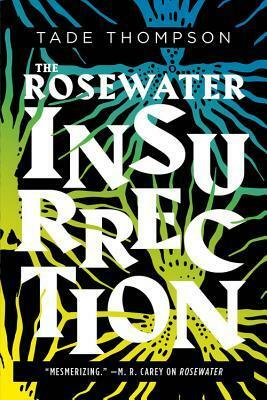 The Rosewater Insurrection is the sequel to Tade Thompson’s astounding “aliens invade Nigeria” novel, Rosewater. If you haven’t read Rosewater, you need to get on that ASAP! And I would highly recommend reading Rosewater before you read The Rosewater Insurrection. No guarantees that this review won’t contain spoilers for the first book. The Rosewater Insurrection shifts the narrative away from Kaaro and to other characters, including Aminat, Kaaro’s lover and a government agent working to stem the tide of the alien invasion. In a wealthy suburb of Rosewater, a white woman named Alyssa Sutcliffe wakes up with no memory of who she is and a determined belief that Alyssa Sutcliffe’s life is not her life. Aminat is given a task: apprehend Alyssa, for Alyssa is the first human to have become majority alien (as a reminder, the alien invasion of Rosewater consists of slowly replacing our cells with alien biology). But difficulties arise as Aminat gets caught in the conflict between the mayor of Rosewater, Jack Jacques, and the president of Nigeria. Out of all the new protagonists, Aminat was my favorite. This series has some great female characters, which is something I always look for. Aminat is capable and dedicated to her job, but she’s not quite as heartless as her superiors. Meanwhile, Alyssa presents an intriguing situation on which I don’t want to say too much… Jack Jacques is another central character, and it becomes easy to wonder whether he’s acting out of self-interest or truly for the benefit of Rosewater. Then again, a lot of the time he doesn’t seem to have much choice. A fourth character is an author who has excerpts of his books appear before he begins chronicling the events of The Rosewater Insurrection as they occur. I’d wondered why his books were being excerpted, so my curiosity was eventually satisfied! The world building of this series is just so amazing. It doesn’t act like the future is a thinly veiled version of today. Instead, it has all sorts of marvelous complexity. There’s a sentient robot, a barter and IOU economic system in Rosewater, weird alien biology, and a secret society of African politicians. And they all mesh together beautifully. I don’t know how to review The Rosewater Insurrection. It’s a wonderfully inventive novel that brings disparate plot threads together in a stunning conclusion that still leaves room for the third and final book of the trilogy. I didn’t read your review too closely because I’ll be reading this very soon. Glad to hear it lives up to the first book! The worldbuilding really is amazing. Also… I just finished Tiamat’s Wrath and I need you to read it so I have someone to scream with. You’ll have to wait until it’s out for me to catch up I’m afraid – not a sniff of an ARC over here!